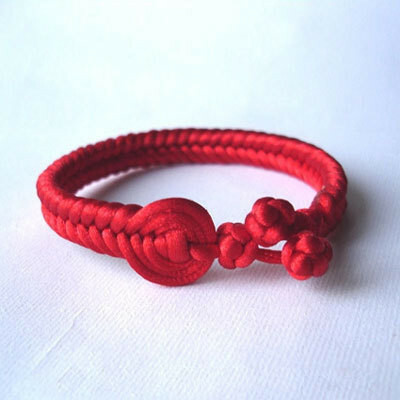 May be you know to weave a bracelet, because bracelet is a common jewelry making. But I am wondering whether you know the making of Chinese bracelets. Chinese bracelets in this tutorial are of Chinese phoenix tail type ending. Phoenix is a sacred bird in Chinese which can bring lucky and auspiciousness. Now I will demonstrate how to weave a bracelet to you. Make a loop over red cords with one red end passing over as you rotate it and then turn upward this loop; pass red cords under the other end, make cross passing and tighten the cords; then a button knot is done. Put three cords between the knotted cords. Make an easy knot below the three cords. Cross weaving the three cords on both sides with the two knotted cords. Lay the cord one over and the other under. And tighten the cords to make three circles to surround the nether knot. Cross weave the redundant cords in the same way, make its length suitable for your wrist. Make button knots in the end. Cut the redundant cords. How do you finish it?